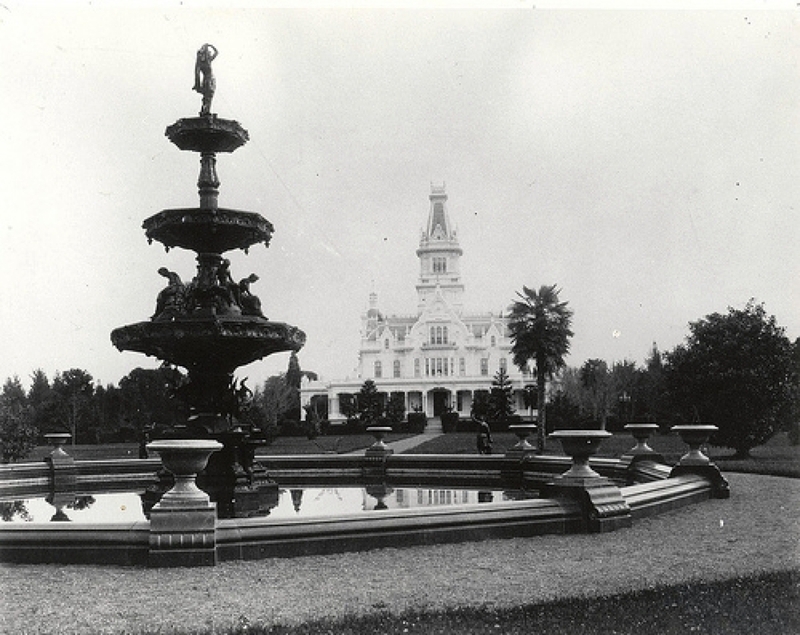 Linden Towers, undated photograph, Alex Brammer Collection, courtesy Brian Witherell, Sacramento, Calif.
SACRAMENTO, CALIF. – The Crocker Art Museum has been given a grand cabinet and elaborate fireplace surround made between 1876 and 1878 for the dining room at Linden Towers, the lavish country estate built in what was Menlo Park, Calif., now Atherton, by silver mining tycoon James Clair Flood (1826-1889). 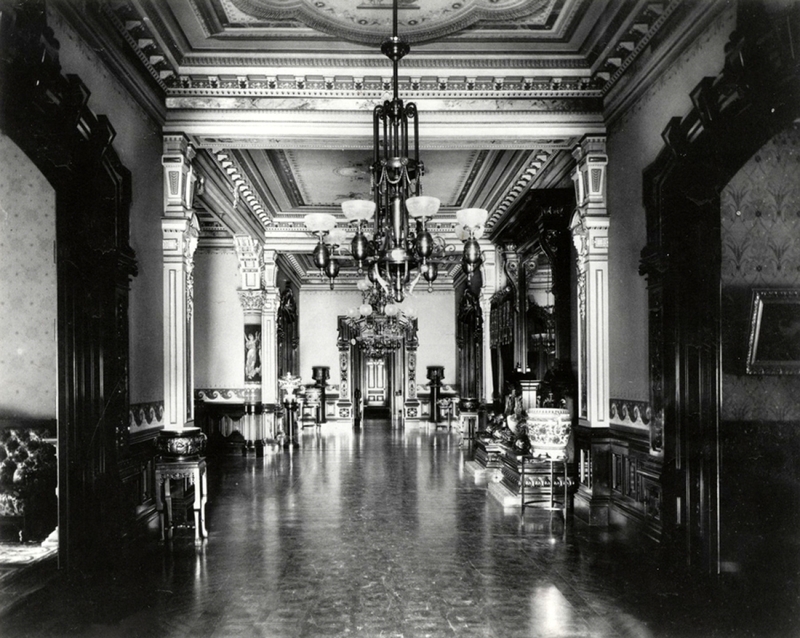 To decorate the lavish residence, which stood almost seven stories tall and had 43 rooms, Flood commissioned the prestigious New York City design and cabinetmaking firm of Auguste Pottier and William Stymus. 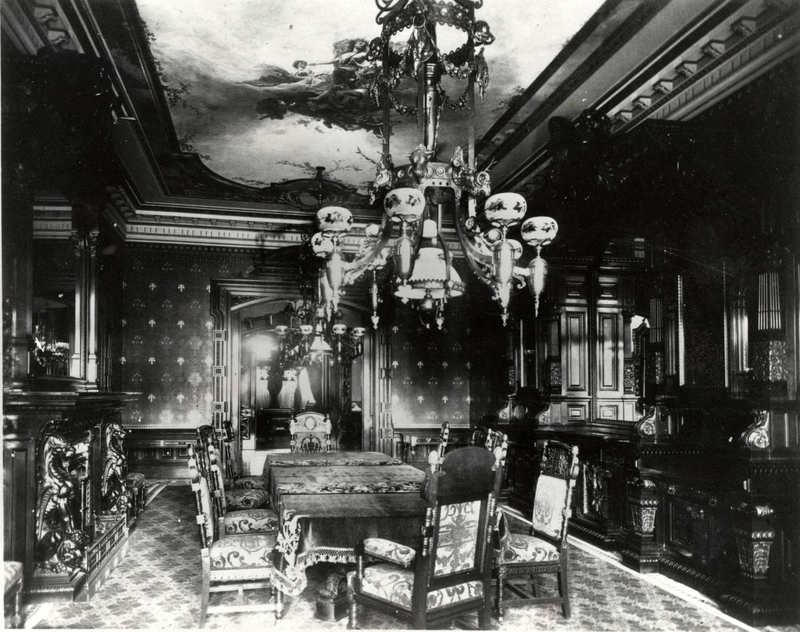 Pottier and Stymus created some of the furniture for late Nineteenth Century America’s most important interiors, including decorations for President Ulysses S. Grant’s White House Cabinet Room. Pieces from the Flood commission are widely considered among the finest examples of their type in the United States. Flood was a self-made man, having been born in Staten Island, N.Y., to Irish immigrant parents. He apprenticed to a New York carriage maker, then followed gold rush fever to California in 1849. After leaving San Francisco briefly to marry, Flood and his new bride, Mary Emma Leary, returned to San Francisco, and by 1857, Flood had opened a saloon with William S. O’Brien. In 1858, Flood and O’Brien went into business as stock brokers, ultimately investing in silver mining stocks. It was Flood’s involvement with silver mining that made Flood – and his three partners in the “Bonanza Firm” – extraordinarily wealthy. The wealth Flood and the Bonanza Firm made dealing in silver-mining shares and controlling the Comstock mines and the Consolidated Virginia Mining Company made it possible to build Linden Towers, an Italianate mansion located approximately 30 miles south of San Francisco. The estate was originally intended to be a country respite, separate from Flood’s mansion in San Francisco, which was the first brownstone building west of the Mississippi and the only mansion on Nob Hill to survive the 1906 earthquake and fire. Still surviving, Flood’s San Francisco mansion is now the home to the Pacific Union club and was declared a National Historic Landmark in 1966. 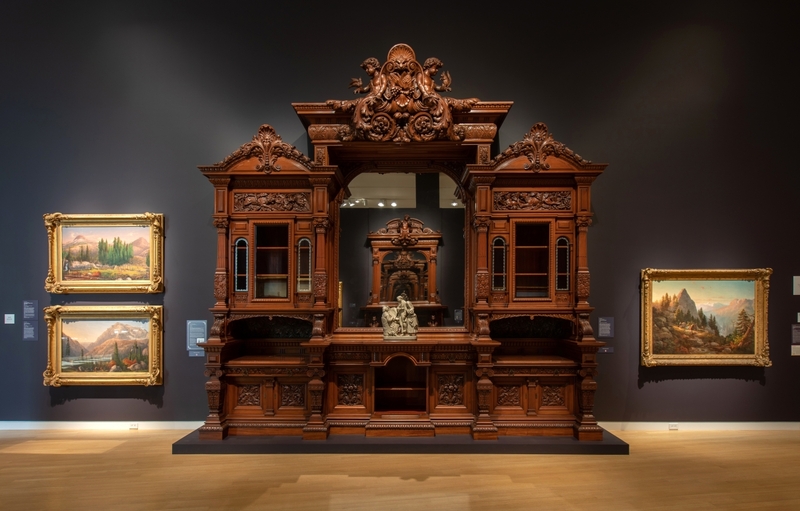 For the Linden Tower dining room pieces that are now at the Crocker Museum, Pottier & Stymus created a monumental cabinet of wood, chased bronze, and rouge-griotte marble – a piece that is approximately 15 feet wide, 15 feet high and ornamented at the top with life-sized carvings of children holding animals. As befits dining room furniture, the cabinet features other hand-carved surfaces related to food and dining, such as pineapples, pomegranates, ears of corn, and hunting scenes. Silver mined from the Comstock Lode is applied to the glass cabinet doors. Sitting across from this cabinet is a magnificent fireplace flanked by winged griffins, their outstretched wings supporting the mantel and their feet crushing the heads of devils, an appropriate metaphor for a fireplace. A large mirror graces the mantel, which itself is crowned by a carved, life-sized child holding a bird and olive branch. Tile, bronze, rouge-griotte marble and various woods are used throughout. Flood died in 1889, and Linden Towers passed to Flood’s daughter, Cora Jane Flood. When she discovered the property was too much to handle, she donated it to the University of California, but it eventually proved too cumbersome to maintain, and the Trustees sold it back to Cora Jane’s brother, James L. Flood. James died in 1926, and in 1934, his widow, who rarely visited the property, made the decision to sell the property and furnishings at auction. The mansion was ultimately demolished. San Francisco attorney Walter Linforth purchased the Pottier & Stymus pieces in 1934 and added a room to his house in which to showcase them. They resided in the Linforth home until the then-owners Neil and Jan Rasmussen decided to sell the property and offered the Pottier and Stymus furniture to the Crocker Museum as a gift. The furniture was installed in the museum’s early California gallery in the fall of 2018 and is now on display alongside the museum’s collection of paintings from the 1870s and 1880s. The museum raised funds to cover the costs associated with moving the pieces out of San Francisco and installing them in the museum. The Crocker Museum of Art is at 216 O Street. For more information, www.crockerart.org or 916-808-7000. 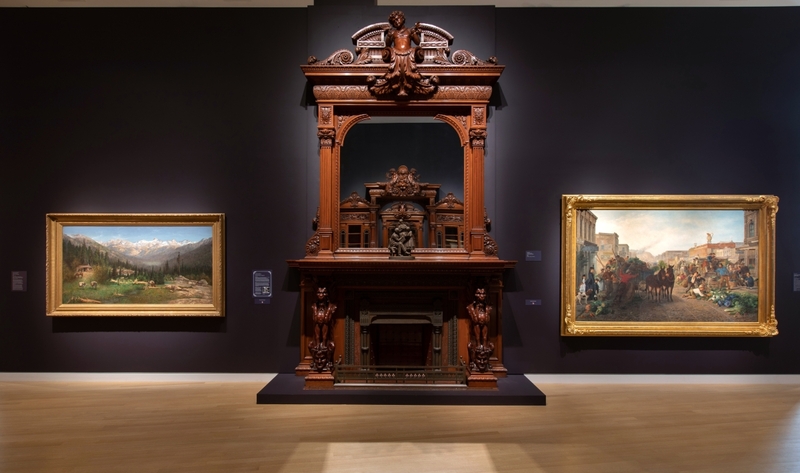 Flood family fireplace surround by Pottier & Stymus, New York City, 1876–78, courtesy Crocker Art Museum.